Yes, apparently I'm infatuated with David Foster Wallace, who I say again writes like nobody I have ever read before, unless of course you count Thomas Pynchon, although Pynchon does it in a more opposite, uninteresting, and mind-numbingly drivel-ous sort of way, at least judging from Gravity's Rainbow, the only book of his I've read, or more accurately tried to read. I find DFW infinitely more readable and captivating and reachable and enjoyable. I become instantly immersed in his characters' real and yet slightly off-kilter personalities as they exist in his relatable, but not so slightly off-kilter realities. Lots of stuff in this book, but the main theme seemed to involve individual realities as they relate to the words and actions of others. Are we intrinsically who we are, or are we just pieces of meat shaped and molded by the effects of others in relation to us? Are our lives only what can be said about them? 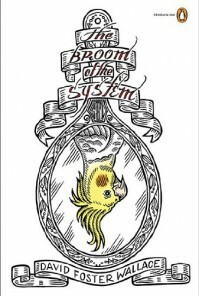 Can we see ourselves as, or be, the bristles of the broom, when people see us only useful for their purposes with respect to the broom's handle? Can we successfully manage the membrane between Self and Others? Apparently, this has to do with Wittgenstein-ian philosophy, which I'll have to read up on, as it seems pretty interesting, or at least DFW made it seem so.